Fresh sprigs of basil, vine ripened tomatoes, and delicious organic all natural mozzarella cheese are the simple ingredients to this delightful dish. Top off this fun appetizer with a drizzle of aged balsamic vinegar, coarse sea salt, and freshly cracked black pepper. Wash and pat dry the fresh sprigs of basil. Then wrap them in a damp paper towel so they do not dry out. Next, half all the cherry tomatoes and set aside. In order to get the nice circular pieces of mozzarella, slice the mozzarella Â½ inch thick then cut with the back end of a pastry tip (or any small circular cutter). 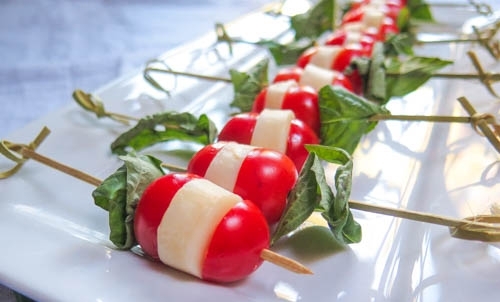 Once everything has been washed and cut, take a wooden skewer and slide a basil leaf, one side of the halved cherry tomato, a piece of the circular cut mozzarella cheese, and top off with the remaining half of cherry tomato. Repeat until all ingredients have been used. Refrigerate immediately. Before serving, drizzle aged balsamic vinegar over the caprese pops and sprinkle of sea salt and black pepper.